German butter cake or butterkuchen is a yeasted sheet cake that is a great alternative to doughnuts or muffins for your morning coffee. Germans are just as likely to serve butterkuchen in the afternoon when they are having kaffee und kuchen (coffee and cake). Simple to make, this cake yields around 20 pieces which easily can be frozen. This makes a great carry-in for a potluck or for a sweets table. Place 4 cups of flour in a large mixing bowl or stand mixer and make a hollow in it with the back of a spoon. Crumble fresh yeast or sprinkle dry yeast in the hollow and fill with the lukewarm milk. Add a pinch of sugar and mix a little to incorporate some of the flour. Let the sponge sit in a warm place for 15 minutes. After the yeast is activated and showing strong growth, add the salt, egg, 7 tablespoons of the softened butter and 3/4 cup of the sugar to the yeast mixture. Mix until the dough is smooth and forms a ball. Add up to 1/2 cup additional flour if necessary. Form dough into a ball, place in a greased bowl, turning the dough once and cover. Let rise 15 to 30 minutes. Roll the dough out to 1/2 inch thickness on a lightly floured board and transfer to a 15x10-inch jellyroll pan. Let it rest again for 15 minutes while heating oven to 375 F.
Dimple the top of the dough all over, using your fingers or the back of a wooden spoon. Mix remaining 1/2 cup of sugar and 2 teaspoons of cinnamon together and sprinkle evenly over dough. Cut remaining 9 tablespoons of butter into small pieces and spread it evenly over the dough. Bake for 25 minutes, or until cake is done and the sugar/cinnamon mixture has melted together and caramelized a little. If you feel the need, turn on the broiler for the last 3 minutes of baking, watching carefully so that the topping does not burn. Alternatively, mix 1/4 cup of sugar with enough water (1/4 to 1/2 cup) to dissolve the sugar and brush this sugar water on the hot cake right after you take it out of the oven. This cake freezes well. After defrosting, crisp it up a few minutes in a 350 F oven. Make this cake the modern way. Add instant dried yeast and all dough ingredients to a bowl and mix together to form a smooth dough. Allow 30 minutes to rest, then proceed as above. 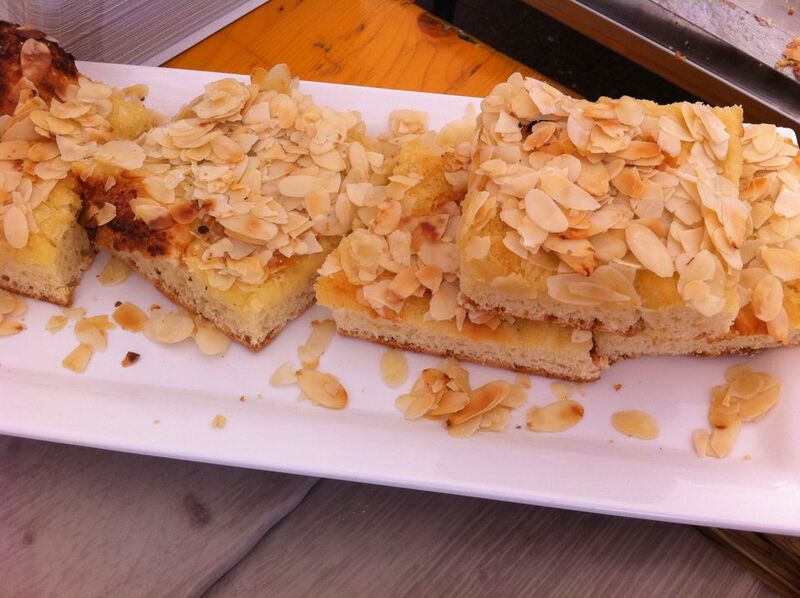 To serve, you can top this butterkuchen with sliced, blanched (or toasted) almonds.